During the Mac n' Cheese Challenge, I came across some pretty cool spots that I filed in my "to revisit for an actual meal" list. Luck would have it that I was invited to Burgundy as part of a media tasting (*crosses another off my list*). 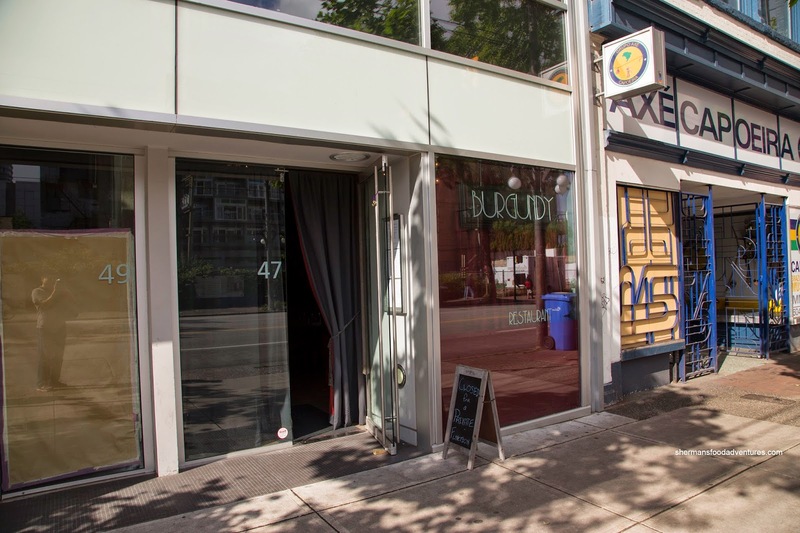 Located on a rapidly changing block of East Hastings, Burgundy joins already established restaurants in Acme Cafe and Save-on-Meats. 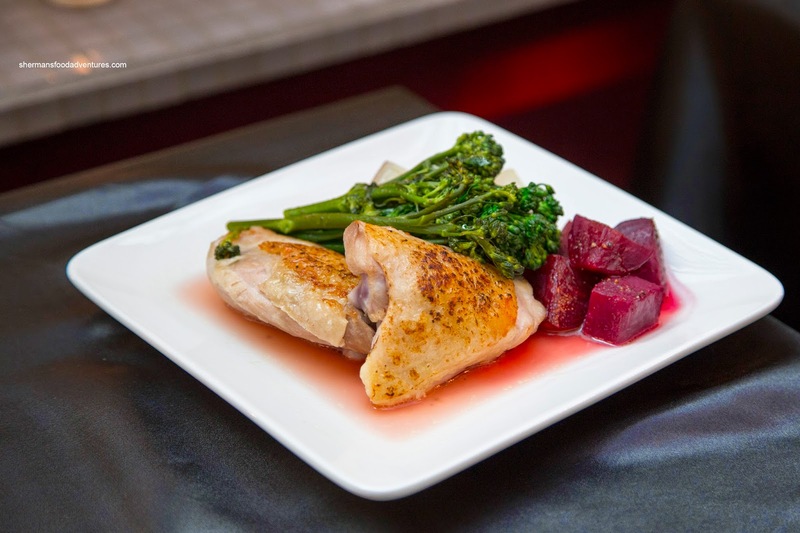 Formerly of the Wallflower, owners Lisa and Erica have continued the theme of eclectic and comfort over to Burgundy, with an elevated twist. 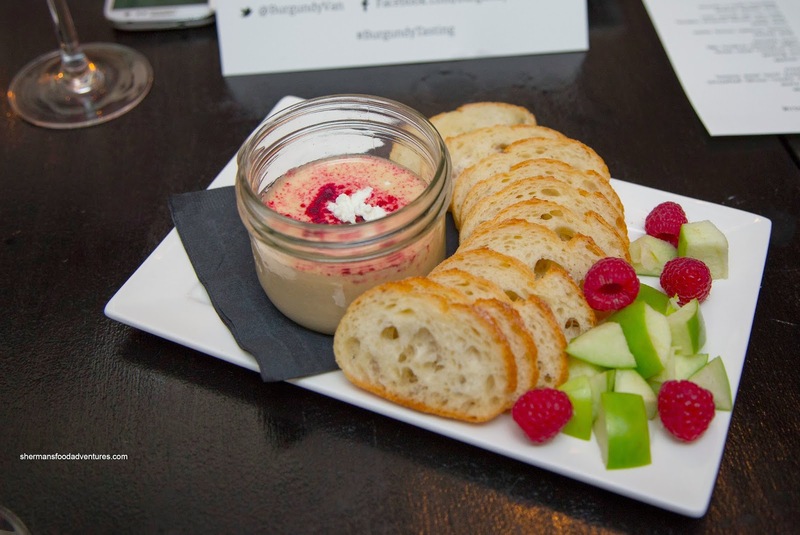 We were served tasting-sized portions of their menu items starting with the Goat Cheese Fondue with baguette, apples and raspberries. I found it to be a little runny, yet smooth and sufficiently creamy. The flavours were purposeful with the right amount of seasoning. 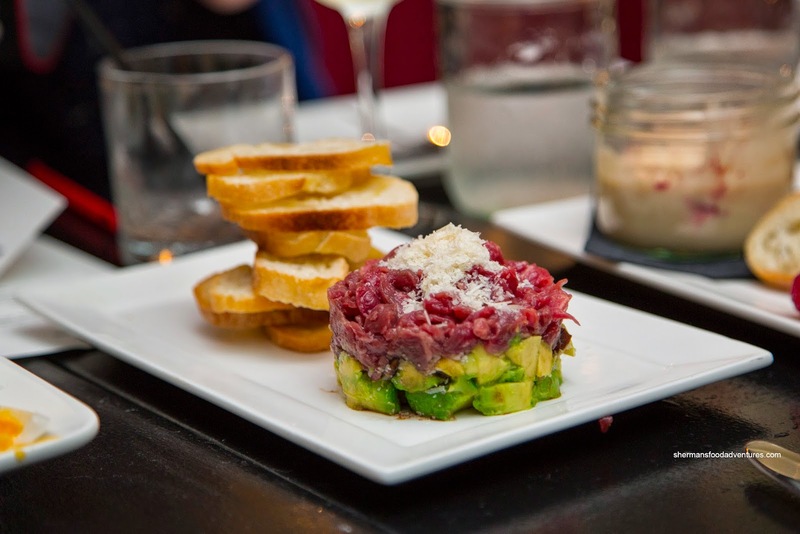 Next, I sampled the Beef Tartar with avocado, balsamic onions and crostini. The textures lived up to its attractive and vibrant appearance. The meat was buttery and smooth while the onions added a mild crunch with a bit of acidity. For me, I would've liked to see even more tartness. 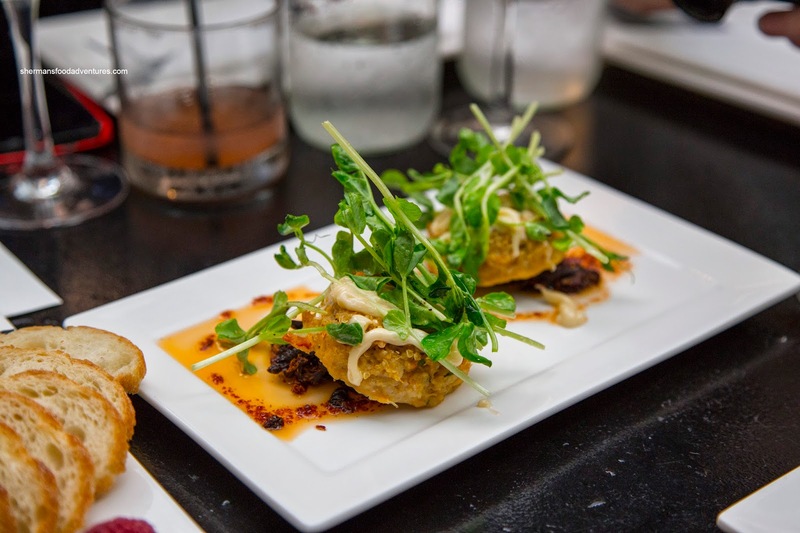 Moving on, we sampled the Crab Cakes with rock crab, quinoa, sundried tomatoes, chili oil, pea shoots and aioli. I liked the flavour profile as there was a natural sweetness accented by the purposeful amount of chili oil. However, the cake itself was rather mealy and the rock hard sundried tomatoes weren't pleasing to chew. 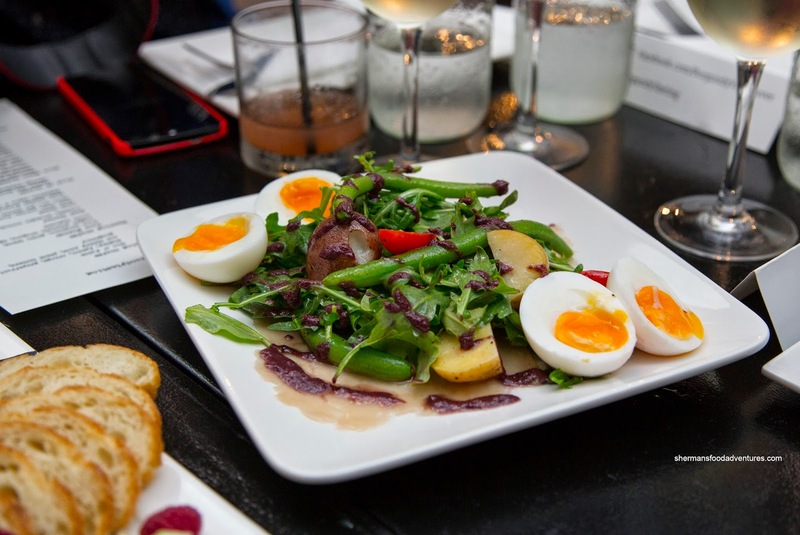 Our last appie was the Tuna Nicoise consisting of tuna carpaccio, green beans, nugget potatoes, arugula, soft yolk eggs and olive tapenade. I thought this dish was executed quite well with fresh tuna, crunchy beans and expertly-prepared eggs. The potatoes were a touch too firm though. As for the tapenade, it was just enough salty olive hit for the dish. 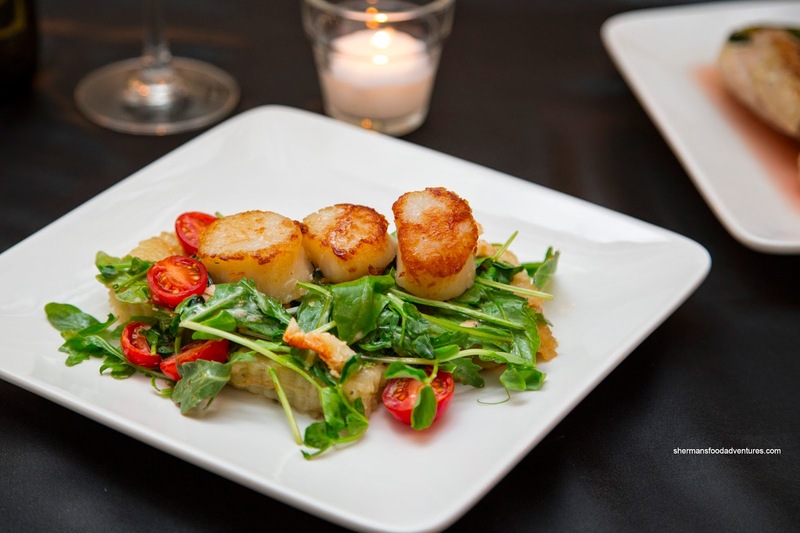 Onto the entrees, the Scallops & Crab with seared scallops, rock crab salad and scallop potatoes was attractively plated. Although the sear was a bit inconsistent, it was sufficient for both colour and texture. I found the scallops to be a touch overdone albeit not by too much. The tarragon aioli dressing was really good as there was a nice acidity that perked up the greens. As for the potatoes, they were soft (not mushy) and cheesy. As evidenced in the picture, the Coq au Vin was the "blanc" version. The crispy rendered skin was fantastic. Despite being sufficiently moist and tender, the chicken was quite salty with a lack of wine essence. 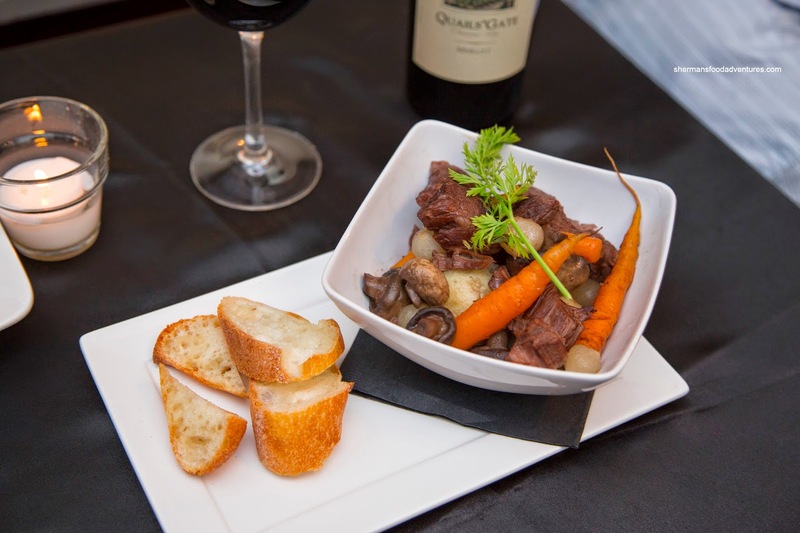 With an equally mild wine taste, the Beef Bourguignon was lacking impact. To be fair, my tasting portion was devoid of sauce which may have contributed to the problem. However, the beef itself was moist while the ample mushrooms partially made up for the lack of depth. 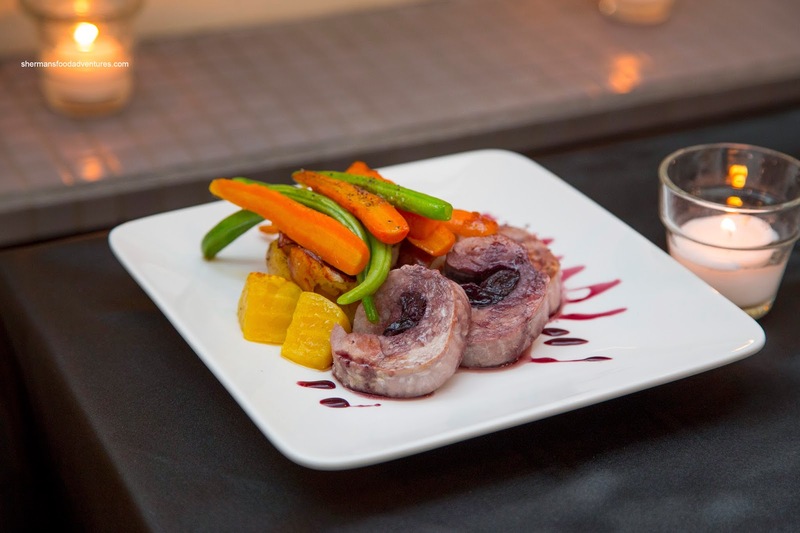 Lastly, we had the Pork Tenderloin stuffed with cherries and thyme accompanied by nugget potatoes and veggies. Since it is a lean meat by nature, the tenderloin was on the drier side. I liked the cherries as they added sweetness and a touch of tartness. The side of veggies were vibrant and crunchy. 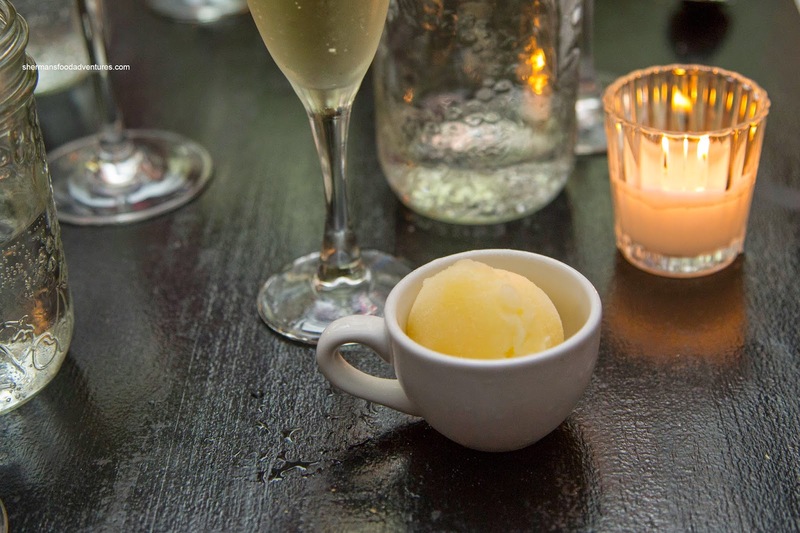 We finished up the meal with the Mionetto Prosecco & Orange Galliano Sorbet. This was the ideal end to our meal as it was smooth, almost creamy in texture. It wasn't too sweet and had similarities with a Creamsicle (which is a good thing). Overall, the meal had its ups and downs. I could definitely see the direction of the menu as it was certainly sophisticated French comfort food served in generous portions. With a few tweaks, there is potential for something good here.